Peanut butter is one of the staples of the snacking and easy sandwich world. Along with frozen waffles and instant noodles, it’s a mainstay in students’ food arsenals. But with so many to choose from, how’s one to know which protein boost will go down easiest? Sure, you may be the betting type, but in this case, you just genuinely want the spread. So, without further ado, Flavour Feud this week presents the peanut butter edition. To keep things even, we’ve restricted the choices to smooth PBs and made exclusive use of Wonder Bread as our neutral pairing. Now stop deciding which cup you’re going to use and pour the milk already. Kraft Smooth (retail price $4.57/500g): This has always been my grandparents’ go-to PB. If I wanted a sandwich, I knew that modestly designed green label with a teddy bear or two on it would be staring back at me momentarily. The product itself is much like the label. No muss, no fuss; doesn’t try to do anything fancy. You take a hefty chomp out of your simple combo and you know it’s a solid PB. Kraft is your second-line centre. It may not be the top dog, but it’s more than capable of carrying the load and with some star power to boot. Skippy Natural Smooth (retail price $4.97/500g): Until this article, I’d never had a jar of Skippy in my life. I did know, however, that the logo bore their iconic squirrel. And for that reason, I’d always felt in the back of my quality-advertising-driven mind I would grab Skippy’s if I ever felt I needed to make a switch. That day has never come, but the opportunity to grab it has, and lo and behold when it did, I was horribly disappointed. The one reason: that delightful cartoon squirrel wasn’t upon the label; in its place was a messy collage of branding and cartoon peanut butter, as if consumers weren’t already blatantly aware of what they’re purchasing. It was like showing up to a pre-2005 Falcons game with Michael Vick not playing. Sure, it’s still peanut butter, but now its main draw isn’t there. To make matters worse, my childhood hopes for the brand were further shattered when my mouthful revealed Skippy to be nothing more than another mediocre PB. It has slightly less buttery texture than Kraft. Not that different to be honest, but enough of a step down to notice. Planters Smooth (retail price $3.47/500g): Planters is a fairly new player on the market, coming out in 2011. It should come as a shock to all that it took the peanut giant that long though, seeing as it was a match seemingly made in heaven. That in mind, it would have been quite easy for the company to fail to meet the high expectations set by PB lovers everywhere. Fortunately for Planters, they met those expectations. It’s a richer peanut butter, but without being overbearingly so. It’s a tad thicker but it washes down easily with the standard beverage pairing of milk. Adams Creamy (retail price $4.97/500g): I grew up primarily on Adam’s Crunchy, so naturally, I felt this could be the one for me right from the start. I wasn’t wrong. 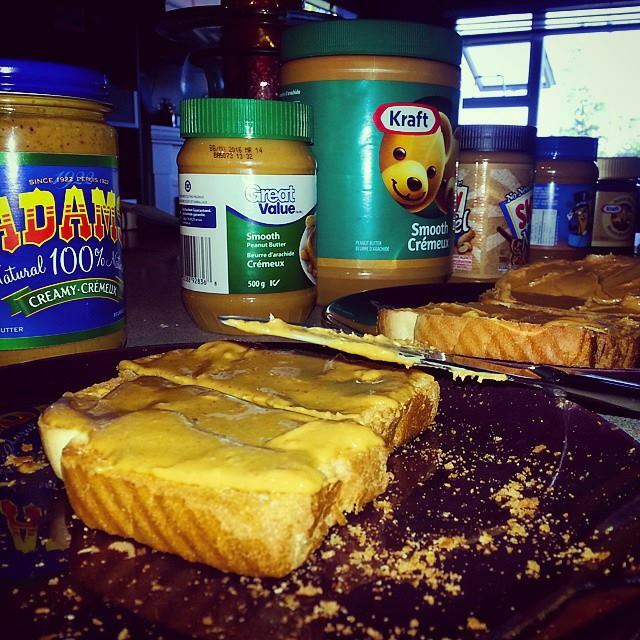 Adam’s is the only true natural peanut butter in this lineup and it makes for a distinctly different experience. Ninety-nine per cent peanuts with no added sugar, colour, or preservatives, zero trans fats. And then that gorgeous thick layer of oil that lets you know you’ve got the real deal on your hands. My mother always used to turn the jar over to deal with the oil but I’ve been a fan of mixing it in myself; there’s something deliciously enjoyable about watching the PB change before your eyes. It’s like cooking for those who have no cooking ability. Getting back to the peanut butter itself, it’s a fantastic gooey mess. Despite the initial oily topping, it mixes surprisingly well for an excellent texture. It tastes like a quality peanut butter and each bite was left wanting only by the fact that the consumption of this nutty goodness had to temporarily be halted as the previous scarfing was downed. Great Value Smooth (retail price $2.97/500g): I feel the need to state here that none of these are bad choices. That said, to my exceptionally refined peanut butter palate, Great Value (Wal-Mart’s brand) comes up short against the competition. It’s good, not great. Tasty, but not exactly leaving you lusting after more. There’s a bit of a frosting feel to Great Value and it comes off a bit cheap. Kraft Peanut Butter with Chocolate (retail price $4.57/500g): This selection really has no business being here. It’s not really a peanut butter. You’re not going to amble down the aisle looking for nutty brown goodness and pick up this little number. PB with chocolate is Kraft trying to be Nutella. And in a contest to see which product is more like Nutella, Nutella will obviously take the punch. Not that chocolatey, not that peanut buttery. A very disappointing product trying to compete in a niche already dominated by a brand that’s got it down pat. Verdict: Although it was a true challenge discerning the different tastes initially, by the end of it, my stomach knew what it wanted: Adam’s. The natural PB brand just brings something unique to the table, and that uniqueness is of the good variety. Planters draws a close second, with Kraft in the middle, Skippy fourth, and Great Value bringing up the rear. Kraft Smooth: Everybody loves those two cuddly bears on the packaging; we’ve grown up with it after all. In almost every household there is Kraft Peanut Butter, an easy-to-get, mediocre option. Peanut butter is hard to differentiate. They’re all good. But I fear this taste test may have inspired me to migrate away from it as the go-to choice. Kraft, in fact, sets a pretty low bar. Skippy Natural Smooth: Terrific consistency, but lacklustre taste. Often recognized as a big player in the mid-tier of the peanut butter, it’s surprising to see that the price is as high as it is. Skippy is an apt choice for those who want a nice feeling of peanut butter as it melts in their mouth, but it’s hard to consider it a first choice. Planters Smooth: Not surprising that a brand known for its peanuts would in fact do peanut butter so well. What is surprising was that it existed at all. Not easy to find, but worth looking for, Planters’ authentic peanut taste and savoury consistency makes it a worthy and noticeable contender. Adams Creamy: Highly touted, but often messy, Adams doesn’t win the battle with flavour, but with an experience. The 100 per cent natural selection is anything but hoity-toity. The peanut butter does not stick in your mouth, it lingers allowing the subtle taste to fade on your tongue. Great Value Smooth: If you are in Wal-Mart, with a budget, looking for peanut butter, don’t hesitate to get the Great Value. Indeed, it is. For a fraction of the other peanut butter choices, you are getting an unpredictably delightful taste of peanut butter that goes down as easily as many of the other selections. Kraft Peanut Butter with Chocolate: The wild card, Kraft Peanut Butter with Chocolate is as much peanut butter as Nutella is peanut butter. For those who like to jump around with spread, Kraft Peanut Butter with Chocolate is worth trying—however, it is not peanut butter. The taste is not as sweet as peanut butter and fainter than Nutella. If you are yearning for a chocolate spread, it really is a one horse race—but that is for another Flavour Feud. Verdict: This was one of the toughest taste tests of my life. You literally cannot go wrong picking a peanut butter. There is good and there is great, sure, but in the grand scheme of things, they’re all great. As you know, many elements that go into peanut butter; a lot of the preference has to do with personal taste. For me it all comes down to flavours, the taste of peanuts. So the winner is Planters.